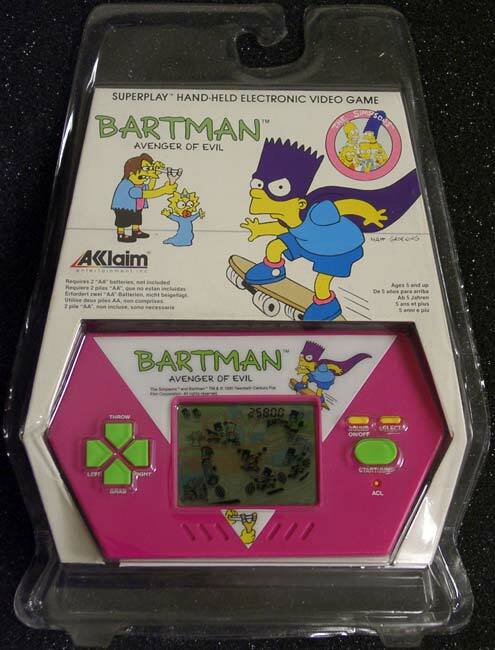 Bartman: Avenger of Evil was a handheld videogame. Nelson's kidnapped Maggie and only Bartman can save her! In the first level Bart tries to collect Bartman's cape, mask and skateboard while dodging walnuts Nelson shoots at him with a slingshot. Being hit with a walnut costs a life. After collecting all three items Bart transforms into Bartman and the second level begins. Bartman skates down the road after a fruit truck Nelson has jumped into. Nelson flings apples and watermelons, trying to knock Bartman off his skateboard. Every so often Santa's Little Helper will appear and give Bartman an apple that he can throw at Nelson when Nelson tries to hit him with a watermelon. Being hit with either an apple or watermelon costs a life. After hitting Nelson with ten apples he's defeated and the game loops back to the first level, but projectiles move faster with each victory. The game continues until the player runs out of lives. Modified on June 30, 2012, at 18:20.